WASHINGTON, D.C. – (RealEstateRama) — Home sales rose 7.5 percent in 2016 and home prices were up 7.0 percent when compared to September 2015. The number of homes sold in September rose 7.5 percent from last year. 3,853 homes were sold in September of this year, while 3,583 were sold during September 2015. This year’s numbers in real estate continue to show a strong and solid market in Iowa. The number of properties sold from January through September were 4.3 percent higher than the same period last year. According to the Housing Trends Report by Iowa Association of REALTORS®, the median sale price for September 2016 is $149,645 as compared to $139,900 in September of last year. The days on market (DOM) increased by 6 days from last year. 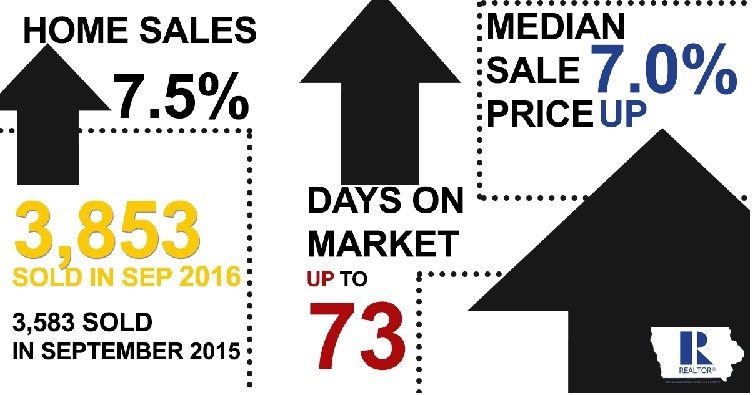 The average days on market in September 2016 was 73 compared to 67 DOM in September 2015. “Unlike major ups and downs seen in other areas of the country, Iowa continues its steady growth. September numbers continued the trend of rising home sales and rising median prices. For specific market conditions, Contact your REALTOR®.” Stated IAR President Ken Clark. Home sales in the third quarter of 2016 were up slightly at 2.5% when compared the same period last year. The median sale price was higher this quarter at 2.7% when compared to third quarter prices in 2015. The information used to create the IAR September 2016 and Third Quarter Housing Trends Report was current as of October 17, at 10:30 a.m. The information is subject to change due to the dynamic nature of the IAR’s housing statistics system, which is updated hourly based on information present in local participating MLS (multiple listing service) systems.